Welcome to the summer movie season. Starting this weekend, for the next four months we'll throw around gaudy numbers for opening weekends that rival the GDPs of small nations, as audiences seek out spectacle. Getting the honor of launching this year's season is X-Men Origins: Wolverine, the first of a number of planned spin-off movies from the X-Men franchise. Marvel and Fox have definitely chosen wisely for the character that could hold a movie on his own, even if Wolverine has been getting a little overexposed. But then, it's not really him carrying a movie on his own, is it? 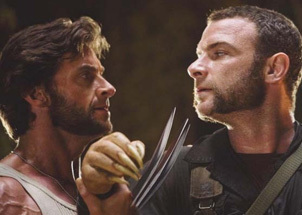 While it does purport to tell the story of how Wolverine came into being, it's also populated with a large cast of mutants that they didn't get to in the other three movies (and confusingly, some they did). Joining the group are fan favorites Gambit, Deadpool, Emma Frost... and I just lost the non-nerd population. Directed by Gavin Hood, an Oscar winner for Tsotsi, Wolverine appears to be kind of a mess plot- and continuity-wise, and the special effects don't exactly seem up to par either. It's going to take a lot of good will from fans to help this one along, which luckily for them is almost certain to be granted. Wolverine was basically the character that opened the last three movies anyway. Debuting in a massive 4,099 theatres, Wolverine should at least surpass the $85 million of X2, but the Memorial Day influenced $122 million of The Last Stand isn't in trouble. Look instead for a weekend of about $91 million. Counter-programming takes the form of Matthew McConaughey and Jennifer Garner in The Ghosts of Girlfriends Past. Falling into that rare category of "Films I Know I'll Hate From the Poster" (past entries include Over Her Dead Body and No Reservations), McConaughey stars as a rakish womanizer (oh, a stretch!) who during his younger brother's wedding is visited by the ghosts of his past relationships. Literally.